Happy Friday, equestrians! 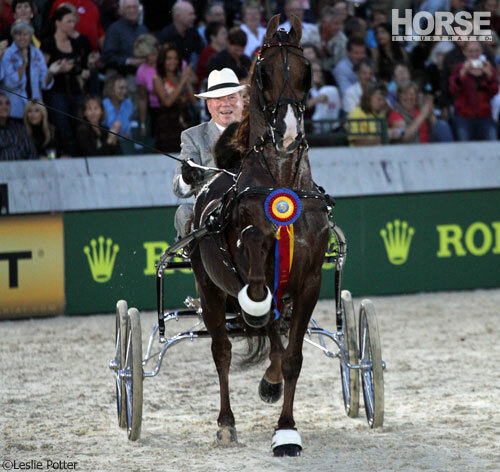 Here’s this week’s horse-world news roundup. International Helmet Awareness Day is tomorrow, July 12. This means you can get rid of your stinky old helmet and trade it in for a shiny new one as participating manufacturers and tack shops are offering one-day IHAD sales. A couple of years ago, I bought a nice schooling helmet for myself on IHAD and with the discount, it was $25! Feel free to share that story when your helmet-shunning friends complain that certified helmets are too expensive. Used car dealers are like modern horse traders. Or so the stereotype goes. In this weird story out of Florida (of course), the Park Auto Mall Preowned Car and Truck Superstore agreed to take a horse named Dallas on trade. I’m really curious to know what happens to Dallas now. Swimmer Michael Phelps and coach Bob Bowman just bought a 2-year-old racehorse and named it “Water Cube.” As you may remember, that was the nickname of the venue at the 2008 Beijing Olympics where Phelps won eight gold medals. 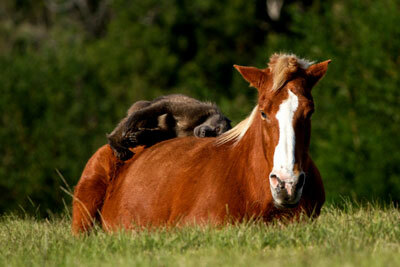 Interspecies friendship du jour: Horse and Baboon. The New York Post published a photoset of an unnamed baboon climbing aboard a napping equine named Jericho at a South African primate sanctuary. Cuter than the baby goats? Tough call. Shy Boy’s biggest fan had the opportunity of a lifetime recently. Shy Boy is a horse owned by clinician Monty Roberts and was the subject of a 1997 documentary. Check out this heartwarming story about how a teenager with cerebral palsy traveled to Roberts’ Flag Is Up Farms in California to meet—and ride—the horse of his dreams. William Shatner is an accomplished equestrian with Saddlebreds, Standardbred road horses and reiners. But when he was invited to serve as grand marshal at the Calgary Stampede parade last week, he opted to ride in a car. Also in Calgary Stampede news, animal welfare groups are again calling for the end of the event’s iconic chuckwagon races after yet another equine participant died. It’s an unsettling trend with these races, as we’ve discussed here on HorseChannel in the past. 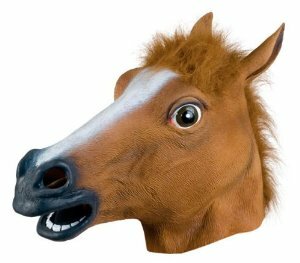 What’s with those horse head masks? Where did they come from, and why does every Internet-fame-seeking hipster have one? Apparently the Secret Service was okay with a horse-masked person greeting the president this week in Denver. The president was unfazed. Wow, this has been a weird week. Enjoy your weekend, everyone! Thank you for the article link on Monty Roberts article it had me in tears.